I was walking up Flatbush Avenue a couple of years ago when I noticed this great old sign in a window attached to an empty store front. In gold leaf lettering it read "Prime Meats." My first thought was, I hope someone saves that sign, it's just too great to get rid of. Walking past that same building this week, I noticed the sign was gone. In fact the whole face of the store was gone; only plywood and building permits were visible. I got a little sad for that old sign, but kept a glimmer of hope that someone had salvaged it. Then I was looking on New York magazine's site and on the first page of the restaurant section -- the sign! And in front of it, two restaurateurs known for their delicious use of local foods: the two Franks of Frankies Spuntino. One of the Frankies spied the sign just as I had, and thankfully had the perfect spot for it. 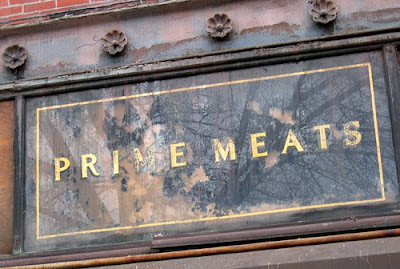 Inspired by the restaurants of yesteryear that procured goods locally, the Frankies are opening a new place called, of course, Prime Meats, right by the old one in Carroll Gardens. You can read the preview info here. I can't wait to try it, and see that old sign in a new-old place.